The seat of the diocese of Marquette, Michigan houses the remains of its first bishop, the Venerable Bishop Frederic Baraga. A Slovenian-born missionary who answered the call to evangelize the native people of Noth America, Bishop Baraga helped protect American Indian tribes from forced relocation and produced a dictionary of the Ojibway language. As bishop, he traveled great distances in harsh weather to minister to his diverse constituency. His body of written work preserves his accounts of his travels. The Bishop Baraga Chapel at St. Peter Cathedral is a site of pilgrimage and veneration for many who are inspired by the Bishop and his work. 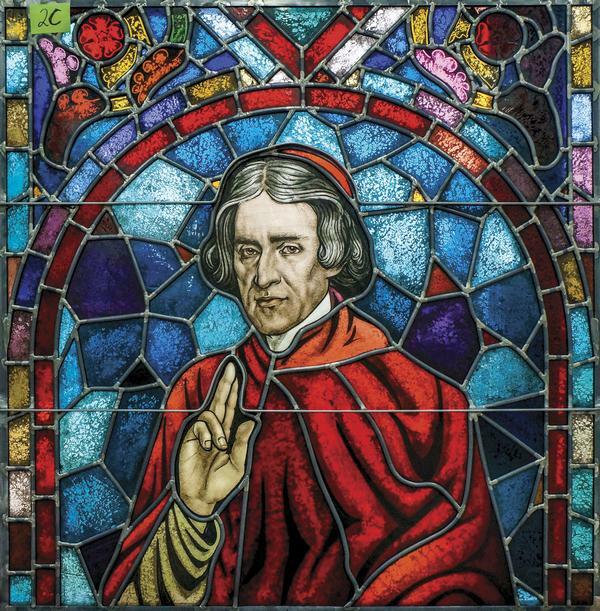 The artists of Conrad Schmitt Studios designed two stained glass windows that reflect the life and works of Bishop Baraga with information provided by the diocese. The windows are traditionally-styled, with hand-painted figures and patterned borders. The window behind the sarcophagus features the Bishop’s Coats of Arms, which includes his own personal crest. 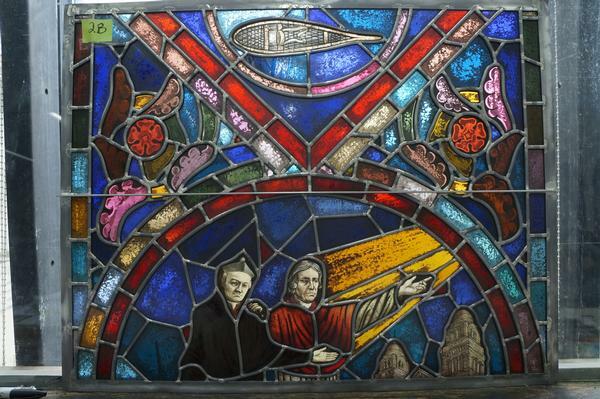 It also depicts Bishop Baraga baptizing a prominent Native American chief. Other images include the Bishop journeying back to Marquette in his final days and a pair of snow shoes, which he was known to don in order to travel during the winter. 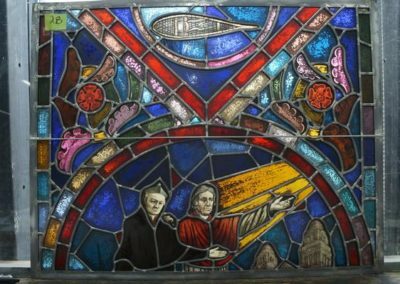 The second window features a full portrait of Bishop Baraga, a medallion featuring his native home of Slovenia, and an image of the Bishop journeying forth in a ship, eager for the missionary work ahead. CSS artisans took great care to match the colors, motifs, and finishes of the cathedral’s existing windows when creating the two new pieces. Several samples were developed after many sketches and designs, as artists and patrons worked together to perfect the style and content. Numerous pieces of the final windows required several fired layers of paint to create the desired level of detail. 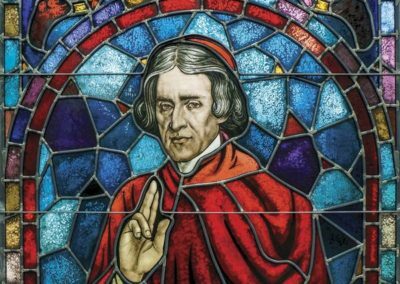 The windows are an excellent tribute to the life and work of Bishop Baraga, an important figure in American Catholic history.